This is one of the toughest questions I face when talking to parents about homeschooling. 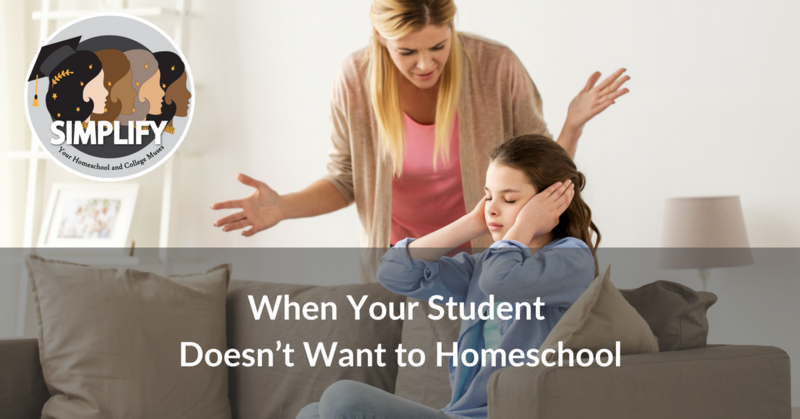 What do you do when your student is unhappy about homeschooling? I think it’s important to say up front that your student’s emotional well-being and your relationship with them is pretty important. Some kids just are not going to ever like homeschooling. You need to figure out if the other issues make it worth it or not. If a student is failing all their classes or not learning basic skills, then it might be worth it. If the social environment at school is so toxic that your student is suffering from extreme anxiety or depression, it may also be worth insisting despite protests. The first piece of advice I’d give is that you should approach younger students differently than older ones. All children deserve our respect. However, most younger students are going to be more fickle. They’re easier to set rules for. If you want to leave it up to a student of any age whether or not they homeschool, then you should. You should always want to hear what they think of their education, no matter how they school. However, if you want to say to a younger student, we will homeschool this year, I’m not changing my mind right now, then that’s okay too. Sometimes it helps younger kids see where the boundaries are. If homeschooling is important to you, then making it clear that unless circumstances dramatically change, that you will homeschool. For older students, especially by high school, unless the only school situations available are truly unsafe or dire in some way, I don’t recommend forcing them to homeschool. They are too old. They need autonomy. If you force them, you are likely sacrificing some of your parental relationship with them. It might work out, but it might not. The situation at your local school is probably not that bad. Even if there are fights, mean kids, and subpar academics, most high schools have bright points and some good teachers. In the vast majority of cases, it will not ruin them to go. No matter what, don’t leave the decision open-ended for long periods of time. No one wants to live in uncertainty. It’s especially not good for kids, who may already feel a lack of control over their lives. If you need time to consider the options, make a firm date after which the decision is set. While I think flexibility is key and you can always re-evaluate a bad decision, make it clear once the decision is set. You don’t want to waffle and let your student think they can sway you by nagging and arguing every day. Of course, while you’re making the decision with your student’s input, you can try to entice them. First up, offer them flexibility and power over their curriculum and school style. You can still make requirements, of course, but let them pick what they study for electives or what time period they cover in history. Let them choose to sleep in and do work later. Let them do a deep dive on an interest. Next, offer them travel and field trips. If you have the ability to take a road trip, do it. See where they’d like to go and try to make it happen. Even if you have to drive and camp, you can probably have some great adventures. Plan ahead when they’ll see friends. If they have school friends, don’t dismissively say, “Oh, I’m sure you’ll see them.” Make a plan, like getting together one weekend a month, or doing scouting together, or making a plan to drive your kid to their house every Friday. Having a specific plan to see their friends can be important. If they are coming from homeschooling already and are looking for more friends, then bite the bullet and join the co-op you haven’t wanted to join, or sign up for more activities in general. Or start a park day or a meet up yourself. Make a specific plan and commitment to giving them more social time. It might include a phone with texting if your child doesn’t have one yet. You can always set firm monitoring rules if you need to. Don’t underestimate how much they need friendships. Finally, it’s okay to bribe a little, but don’t make promises you can’t keep. If homeschooling will make it easier to take a fun vacation or eat your favorite lunch every day, it’s okay to try and use that. If you’re stopping private school, you might be able to afford something fun as well. However, don’t go over the top or promise a gift or experience you’re not sure you can deliver. That’s just going to undermine your relationship, especially with an older student. A nudge to help them decide to homeschool is okay, but a big quid pro quo isn’t going to serve either or you very well. I firmly believe that homeschooling is best for lots of families. However, you need your student on board as a partner to make it work most of the time, especially by the time they’re teenagers. If it doesn’t work out, let go of the guilt. Life is long and there’s plenty of time for them to find their way to the sort of education they need.